There isn't a train station at Machu Picchu itself. The nearest train station is in the nearby town of Aguas Calientes. Regular buses run between Aguas Calientes and Machu Picchu, the journey takes about 20 minutes and costs US$12 each way. Trains no longer run from the train station in Cusco city center. Trains now depart from a station in Poroy, a small village about a 20 minute bus/taxi ride from downtown Cusco. However very few trains depart from Poroy. 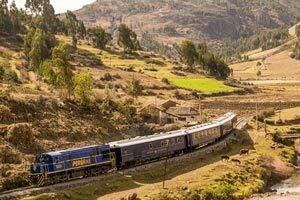 The vast majority of trains to Machu Picchu actually depart from the station in the beautiful Inca town of Ollantaytambo which is located in the Sacred Valley about 65 kilometres from Cusco. Don't worry we'll tell you how to get to Ollantaytambo a bit later. During the peak months of May to September all of the train tickets to Machu Picchu can be sold out several days in advance. If you are on a tight schedule it is absolutely essential that you make you train reservations as far in advance as possible. 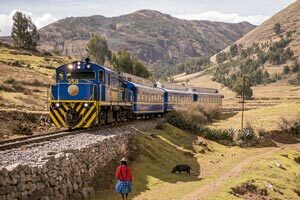 Do not wait until you arrive in Cusco to buy your train tickets. 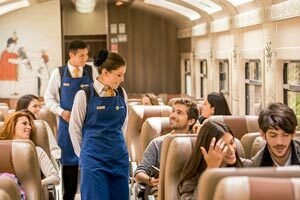 PeruRail have improved their online reservation system and it is now fairly easy to make a booking and pay online using the credit cards VISA & MasterCard and also PayPal. Their website allows you to check availability and search for the cheapest service available. Once you have bought your ticket online don't forget to print out your E-ticket and bring it with you to Peru. Before boarding the train you will have to check-in at the train station and change your E-ticket for an embarkation ticket. Try to arrive at the train station at least 30 minutes before the train departs. 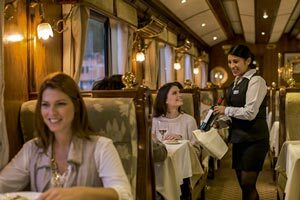 Peru Rail currently offers only 4 departure a day to Machu Picchu from the station in Poroy, one departure on the more economic Expedition service, two departures on the comfortable Vistadome service and 1 departure on the ridiculously high priced Hiram Bingham service. Tickets for the Expedition and Vistadome services often sell out many weeks / months in advance so best to book online as soon as you can. If tickets have already sold out for this service don't panic! Most of the trains to Machu Picchu depart from Ollantaytambo station (in the Sacred Valley) and not Poroy station. Prices valid from 01 April 2017. The prices given are the price each way when bought as part of a return ticket. For example if you take the Vistadome 31 service from Poroy to Aguas Calientes (US$96) and come back on the Vistadome 32 service (US$111) it will cost you 96 + 111 = US$207 per person. The prices shown in brackets are only if you decide to buy just a one way ticket. 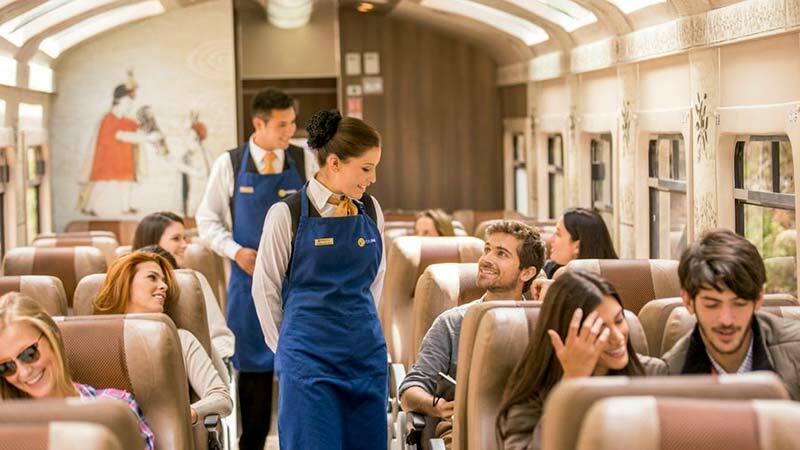 For example say you walk the Inca Trail to Machu Picchu and then want to buy a one way ticket from Aguas Calientes to Poroy on the Vistadome 604 service it will cost you US$125 per person. *The above timetable and prices were taken from the Peru Rail website on 01 March 2017 and are valid until the end of 2017. Details, times and prices may be subject to change. The information refers to arrival & departure times at Aguas Calientes station. Walking from the train station to where the buses depart for Machu Picchu plus the bus ride can add another 30 minutes to you journey assuming that you don't have to queue for either your bus ticket or your entrance ticket. Booking online is a similar process to booking flights. After you have paid for your ticket online you can then print out two copies of an E-ticket which you will have to bring with you to Cusco. The E-tickets will have to be exchanged for embarkation tickets at the train station so try to arrive at the station at least an hour before departure. (ii) Ollantaytambo (Sacred Valley) to Aguas Calientes (Machu Picchu) and back. 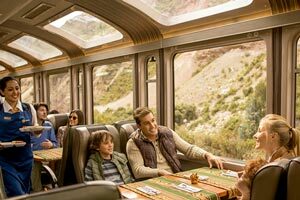 This involves a combination of bus/taxi between Cusco and Ollantaytambo and then train between Ollantaytambo and Aguas Calientes. The round-trip services between Poroy (Cusco) and Aguas Calientes (Machu Picchu) tends to fill up pretty quickly so if they're full you'll have to travel by road from Cusco to Ollantaytambo and then take the train between Ollantaytambo and Aguas Calientes (Machu Picchu). Ollantaytambo is about 65 kilometres from Cusco along a scenic paved road. You can take a taxi from Cusco to Ollantaytambo which takes about 1 hour 45 minutes and costs about US$35. Alternatively you can take a local bus from Cusco to Urubamba and another local bus from Urubamba to Ollantaytambo which takes about 2 hours 30 minutes in total and costs about US$5 per person. Trains between Ollantaytambo and Aguas Calientes take about 1 hour 30 minutes. You have to arrive at the station 30 minutes before the departure time. 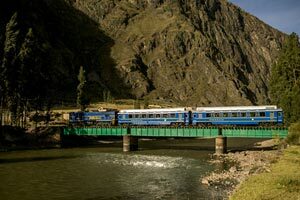 Information about "Routes & Timetables" between Ollantaytambo and Aguas Calientes can be found under the heading "Sacred Valley > Machu Picchu." The prices given are the price each way when bought as part of a return ticket. 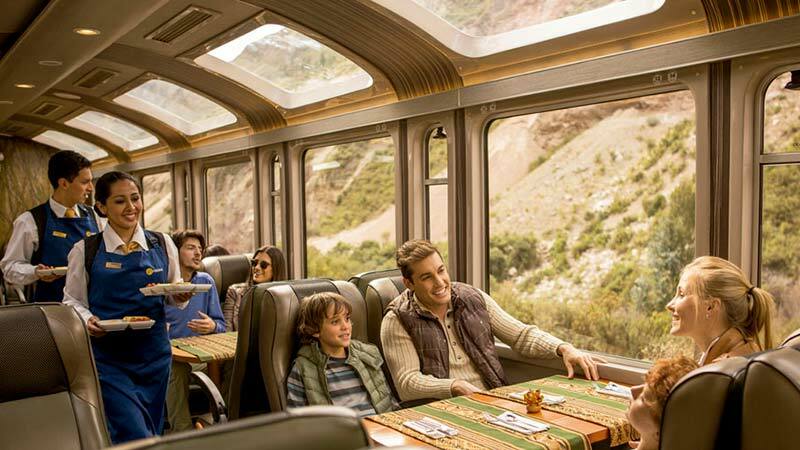 For example if you take the Expedition 83 service from Ollantaytambo to Aguas Calientes (US$66) and come back on the Expedition 84 service (US$66) it will cost you 66 + 66 = US$132 per person. The prices shown in brackets are only if you decide to buy just a one way ticket. For example say you walk the Inca Trail to Machu Picchu and then want to buy a one way ticket from Aguas Calientes to Ollantaytambo on the Expedition 84 service it will cost you US$92 per person. The Expedition service has large panoramic windows and additional windows in the roof allowing you to enjoy the mountain scenery. A snack and hot drink are included with the Expedition service. There is also a table in front of you and the seats are comfortable. Overall not a lot of difference from the more expensive Vistadome service and, in our opinion, offering good value for money. The Vistadome service has large panoramic windows and additional windows in the roof allowing you to enjoy the mountain scenery. A snack and hot drink are included with the Vistadome service. There is also a table in front of you. With the Vistadome service you get posh leather seats which are very comfortable with more leg room than the Expedition service. However the main advantage is that you arrive at Aguas Calientes before the Expedition train (but only just). 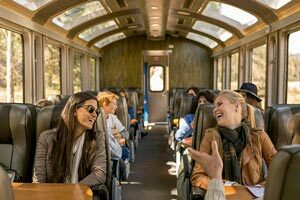 The Hiram Bingham train is the most luxurious way to journey between Cusco and Machu Picchu. 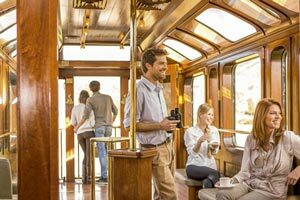 The carriages are painted a distinctive blue and gold while interiors are luxurious, warm and inviting with elegant decoration in the style of the 1920's Pullman trains. As passengers step on board they are encompassed in a world of polished wood, gleaming cutlery and glittering glass. The train consists of two Dining Cars, an Observation Bar Car and a Kitchen Car, and can carry up to 84 passengers. Enjoying such a luxurious journey as you pass through small villages that can't afford adequate schools or healthcare may make some people feel uncomfortable, and rightly so. Ecotourism at its worst.